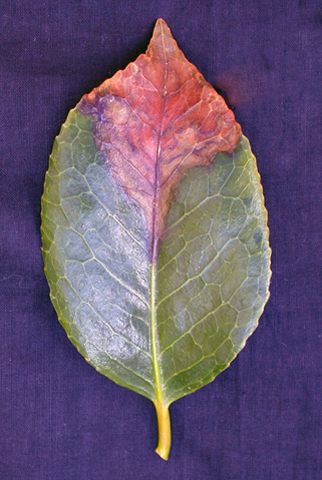 This foliage disease is most damaging to young Camellia and rhododendrons plants. The symptoms appear as pale brown patches on the leaves, leafstalks and on the flowers. Tiny black spots (pustules) appear in the brown patches, from these, spores develop. These spores are dispersed in rainwater to other parts of the plant, in bad attacks affected leaves tend to fall off. The problem seems to mainly affect newly propagated plants, although it can also attack larger plants, and is most likely to occur during periods of high humidity. No fungicides are available for amateur gardeners to treat this disease, meaning the only control available is to remove and destroy affected parts of the plant. To prevent the spread and germination of the spores carry out this task when the leaves are quite dry, otherwise the spores may be tranferred to other parts of the plant by dripping water.